Axine’s journey began when Colleen Legzdins, a materials engineer working on fuel cell technology at Ballard Power Systems, decided to apply her knowledge of electrochemistry to environmental challenges. She soon settled on wastewater treatment, and focused specifically on the problem of recalcitrant organics. In industrial applications, these compounds can be resistant to conventional processes. They create operational bottlenecks, prevent water reuse, and are increasingly subject to tougher discharge regulations. These difficulties can have a significant effect on production, from equipment downtime to higher costs and fees. Recognizing the opportunity, Legzdins developed a one-step proprietary electrolytic oxidation process designed to treat high concentrations of toxic and biodegradable organics, as well as ammonia and pathogens, without chemicals and without producing sludge. “Colleen built a few prototypes and tested them for a couple of years on her own in her garage and a rented lab. It’s a true start-up story,” says Jonathan Rhone. Rhone is the president and CEO of the company that has resulted: Axine Water Technologies. Although this type of technology is not exactly new, the approach is disruptive. The concept of a modular, small footprint system that can be retrofitted to existing wastewater treatment plants has significant market potential. “It’s about performance and cost, not incremental improvements,” says Rhone. He claims that, when comparing the technology to incumbent solutions, the cost is between three and ten times lower than existing solutions. With savings on energy, maintenance, chemicals, and the costs of handling sludge, the return on investment would seem to be tremendous. “We’ve got a very strong value proposition for early adopters,” says Rhone. Even though the technology applies to a number of sectors, Axine started with the oil and gas industry. “Pain, money, and motivation—those are our criteria for picking our markets. Our focus is to solve a commercial issue and become the new standard for treating dissolved organics in industrial wastewater,” says Rhone. 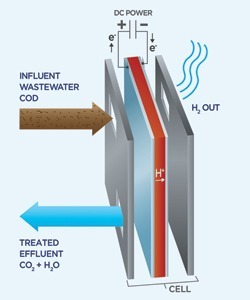 The company’s long-term vision is to incorporate the technology into the design of new wastewater plants to displace conventional biological and chemical oxidation, and other traditional wastewater equipment. Axine expects to be in the field with pilot plants by end of 2013 and have early commercial plants by end of 2014.